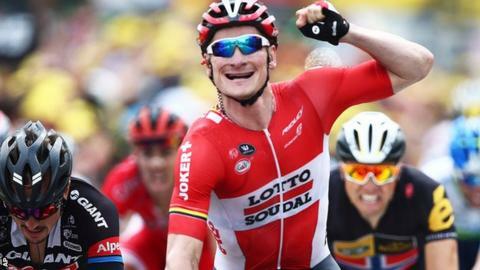 Andre Greipel sprinted to his third stage win of this year's Tour de France in Valence as Britain's Chris Froome comfortably kept his overall lead. The German rider held off countryman John Degenkolb and Norwegian Alexander Kristoff on the line in a bunch sprint. Briton Mark Cavendish was not involved in the sprint on Stage 15 as he was dropped on the first climb of the day. It was a quiet day for Froome who still leads Colombian Nairo Quintana by three minutes 10 seconds with a week to go. A nine-man breakaway was caught with 40km to go, and while Italian Matteo Trentin and Canadian Ryder Hesjedal attempted a further break, the peloton swallowed them up 10km further down the road. Czech Zdenek Stybar - winner of stage six - broke away with three kilometres to go but ran out of steam and was caught inside the final kilometre as Greipel sprinted to victory. Shortly after Saturday's stage finished in Mende, Froome revealed that a fan had thrown a cup of urine at him and called him a doper. It came a day after Team Sky team-mate Richie Porte said he was punched while on the road. An eventful Saturday also saw Froome extend his lead and Colombian Nairo Quintana leapfrog Tejay van Garderen to take second place in the general classification. There was almost nothing of note on Sunday as far as Froome and the battle for the yellow jersey was concerned. The main contenders remained tucked safely away in the main group all day and, with a bunch sprint at the finish, there were no attacks towards the end by Froome's rivals. "It was a good day out there, there was a great atmosphere on the road and no unfortunate incidents today," said Froome. "We have got five real racing stages left and we are into the tail-end of the race now. There are some tired bodies out there on the road but we are in an extremely fortunate position in that we have got nine riders left who are still fit and healthy." After Sunday's stage, Froome was again asked about the suspicions over doping. Reporter: "Chris, you have been saying that you're the first, you're in the yellow jersey because you've worked extremely hard for that. We know this but what is troublesome is that all those who preceded you were saying the same. Lance Armstrong would keep telling us that he was the first because he was working more than the others. Can you understand that the wording and the explanation that you give revive bad memories?" Froome: "Times have changed, everyone knows that, times have changed. This isn't the Wild West that it was 10-15 years ago. Of course there are always going to be riders who take risks in this day and age but they are the minority. It was all the other way around 10-15 years ago. There is no reason for that suspicion to continue." German Greipel was understudy to Cavendish at HTC-Columbia. When it was suggested to Cavendish that Greipel would ride the 2010 Tour with him, Cavendish said: "There's no chance he's coming to a bike race that I'm in. Me on bad form is still better than him." It has been a different story this year. Greipel - known as the Gorilla - defeated a host of rivals including Cavendish to win stage two and beat his former HTC-Columbia team-mate to claim another victory on stage five. The pair hardly went head-to-head on Sunday as Cavendish - who is reportedly unwell - had been left behind on the climb out of Mende at the start of the day and rolled home in a group of 23 riders more than 14 minutes behind the winner. And after the ninth Tour stage victory of his career, Greipel said: "The team supported me from kilometre zero, they kept me out of the wind and in the front group. "At the end we made it perfectly to keep in a good position for the sprint and I went full gas and kept it to the line." BBC Sport's Matt Slater in France: "First, the good news, from a British perspective anyway: Sunday's stage was a much happier one for Chris Froome and Team Sky than the urine-soaked slog of Saturday. "The race leader and his team-mates reported no new outrages, and they have been heartened by messages of support from rival riders and team managers. "The news was less good, however, for Cavendish, who has been struggling with stomach problems and was dropped on the day's first climb. "This meant he missed out on the fourth of five clear-cut chances for the sprinters and now trails his German rival Andre Greipel 3-1 in this race. Out of contract at the end of the season, and desperate to reclaim his status as cycling's fastest man, Cavendish will not lack for motivation to get to the fifth and final sprinters' stage in Paris." Geraint Thomas's preview to stage 16: "This descent into Gap for the stage finish is very dodgy indeed. Riding at the 2003 Tour, Lance Armstrong had to go off the road and ride across a field to avoid Joseba Beloki, who had fallen off ahead of him. And the last time the Tour rode it, in 2013, Froome and Contador had to go off the road too."